Not that they would! 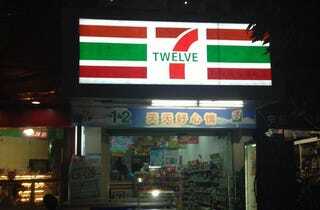 But the next time you step into a, say, 7-Twelve in China or a 7-Minutes in Russia, remember that you're not actually in a 7-Eleven. Got it? Of course you do. Recently, Twitter user Livein_China uploaded the above pic of a faux convenience store. But China is hardly alone in being home to fake 7-Elevens (the vast majority of 7-Elevens there are totally real). You can find them the world over. Obviously, most are local small mom and pop operations, trying to make a quick buck. 7-Apple? 7-Mac? iEleven? I give up. 7-Eleven restaurant and bar. Looks legit. 7-Mercy. Yep. This convenience store was located in Japan and has since been shuttered. Fittingly, a real 7-Eleven opened nearby. I'm assuming 7-Mercy was closed down after 7-Eleven became a Japanese-owned company.